You use it every day, but do you really know what it is? Read on to learn all you need to know about this staple of your morning routine. Antiperspirants and deodorants are often confused for the same thing, but they actually function quite differently. Antiperspirants contain ingredients that physically block sweat glands, while deodorants are created to mask odors. Antiperspirants contain active ingredients that only work in the presence of moisture. When you begin to sweat, the antiperspirant turns into an active gel. That gel works its way into sweat ducts, blocking them, so sweat can’t escape. The best antiperspirants go deeper down into the sweat glands and create a stronger “plug”. Using an antiperspirant doesn’t mean your body will stop sweating entirely though. In fact, if you use an antiperspirant on your underarms, your body will make up for it by sweating from a different location. Luckily, that other location may not be as prone to odor. You see, interestingly, sweat by itself is odorless. But in the case of armpits, or other areas hidden by folds or creases, bacteria can naturally accumulate. This bacteria feeds off of the proteins in the sweat and the chemical reaction that occurs is what actually creates the odor. To learn more about sweat, click here. Deodorants do nothing to prevent sweat. However, they will help cut down on odor. Not only can you choose from a variety of fragrances, but many deodorants also contain an antibacterial agent to reduce the amount of bacteria on the skin. This decrease of bacteria, in turn, leads to a reduction in odor. What Should I Look for When Buying an Antiperspirant Deodorant? When you’re standing at the shelf, the number of options available can be daunting. Knowing what to look for can help make things easier. You should compare labels and choose products that contain a high-level of active ingredients, such as Arrid™. 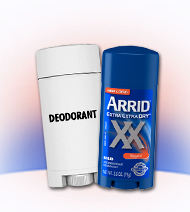 Our line of antiperspirant deodorants offers a variety of forms, including solids, gels, aerosols, roll-ons and cream. And there is a selection of refreshing scents to choose from, so you can find the one that’s just right for you. Try it and you’ll see, you don’t need to spend a lot, to get a lot.